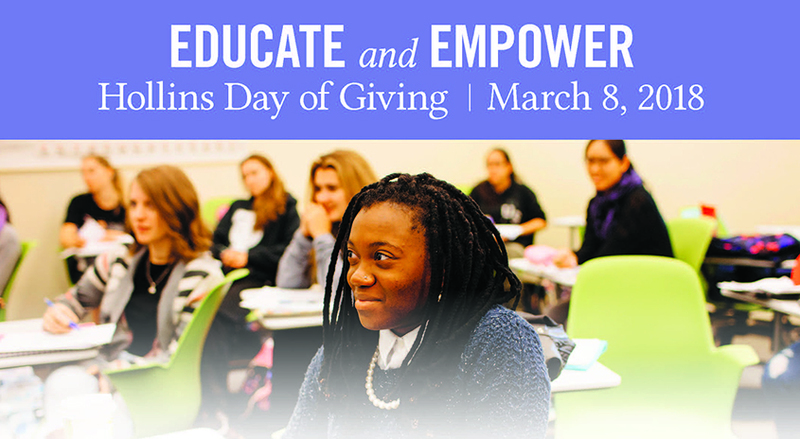 This International Women’s Day, Hollins will be celebrating by giving back to educate and empower the next generation of Hollins students. Make your gift to the Hollins Fund on March 8th in honor of a special woman in your life! Watch for your Hollins Day of Giving postcard in the mail or print this PDF. Fill in the name of your honoree, take a selfie, and post on social media with #HollinsDayofGiving. Be sure to tag Hollins Alumnae Association. 671 donors raised $145,757 in 24 hours! Morning Class Challenge – The class not in reunion this year with the most donors before 12:00 pm EST unlocks $3000 for Hollins made in honor of their class! 1992 Is the Morning Class Challenge Winner! 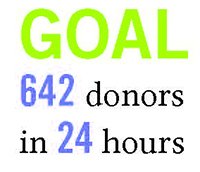 Afternoon Reunion Class Challenge – The Reunion class with the most donors before 5:00 pm EST unlocks $2,500 for Hollins made in honor of their class! 1958 and 2016 Tied for the Afternoon Reunion Class Challenge Winner! Late Night Young Alumnae Challenge – The young alumnae class (2004-2017) with the most donors before 11:00 pm EST unlocks $1,842 for Hollins made in honor of their class! 2006 Is The Late Night Young Alumnae Challenge Winner! Last Chance Challenge – The donor with the largest gift between 10:00 PM and 11:59 PM will win a Hollins scarf! Margaret Gibbs ’71 Is The Last Chance Challenge Winner! Facebook Winner is Alexis Tahinci ’06! Instagram Winner is Emili McPhail ’18! Twitter Winner is Suzanne Harper ’93! Facebook winner is Christine LeFever Kmieczak ’92! Instagram Winners are Claire McCown ’13 and Eliza Pipkin Ray ’13! Set up an ongoing monthly, quarterly, or yearly gift through our Sustaining Gift option or opt for an Installment Pledge for up to five years and have your gift deducted monthly, quarterly, or yearly. Note: New gift structure begins July 1, 2018. Refer to The 1842 Society and Miss Matty’s Circle page for more information.